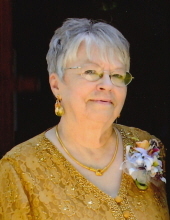 Janice Elaine Umbach, age 75, of Anthon, Iowa, passed away on Wednesday, February 6, 2019, at her residence of Anthon, Iowa. A Funeral Service will be held Tuesday, February 12, 2019, at 10:30 a.m., at the St. Paul Lutheran Church - Midway of rural Battle Creek, Iowa. Rev. Marty Davis will officiate. Committal will follow in the Mt. St. Joseph Catholic Cemetery of Anthon, Iowa. A Visitation will be held Monday, February 11, 2019, from 5:00 p.m. to 7:00 p.m., with a Prayer Service at 7:00 p.m., at the Armstrong-Van Houten Funeral Home of Anthon, Iowa; The Armstrong - Van Houten Funeral Home of Anthon, Iowa is in charge of the funeral arrangements. Condolences may be sent online www.armstrongfuneral.com. Janice Elaine Hamann was born on October 8, 1943, in Battle Creek, IA, to Alfred and Roberta (Lewis) Hamann. Her father passed away during WWII at which time she went to live with her grandparents Pearl and Scates Lewis. She lived with her grandparents until she was 8 years old and then went to live with her mother Roberta (Marvin) Petersen. She attended country school and graduated from Anthon-Oto High School with the class of 1961. Following graduation, Janice went on to attend beauty school in Sioux City, IA. After receiving her accreditation and license, Janice worked as a beautician for several years in Anthon, IA. On February 14, 1975, Janice married Tom Umbach in Elk Point, SD. To this marriage, Tom welcomed Janice’s three children Randy, Suzi and Tiffany. Janice and Tom then welcomed four children together Jenifer, Tony, Lincoln and Mike. Janice was a homemaker raising her children and babysitting for multiple families and friends within the community. In her spare time, Janice loved to sew, cross-stitch, crochet, quilt and tend to her flowers and garden. She loved to feed and watch the birds and squirrels. She also enjoyed watching her favorite TV shows NCIS and various cooking shows. Janice’s greatest joy in life was her grandchildren. She treasured spending time with them. Janice was born and raised in the Lutheran faith and after marrying Tom, she converted to Catholicism. She was a member of the Catholic Daughters and the local Ladies Auxiliary. Left to cherish her memory are her husband Tom Umbach of Anthon, IA; children Randy (Abby) Taylor of St. Paul, MN, Suzi Taylor of Anthon, IA, Tiffany (Bill) Fundermann of Creston, IA, Jenifer Umbach of Chicago, IL, Tony (Allison) Umbach of Anthon, IA, Lincoln (special friend Alison Seuntjens) Umbach of Anthon, IA and Mike (Lindsey) Umbach of Anthon, IA; 13 grandchildren: Mason, Grant, Shayla, Diedrich, Danielle, Jayden, Gavyn, Scates, Keegan, Sydney, Carson, Josie, Brock; brother Byron (Marcia) Petersen of Mapleton, IA; sister Rhonda (John) Boddicker of Platte City, MO; uncle Robert (Eleanore) Lewis of Correctionville, IA; aunt Barbara Buckley of Kingsley, IA; extended family and friends. Janice was preceded in death by her mother Roberta Petersen and her father Alfred Hamann; stepfather Marvin Petersen; grandparents Pearl and Scates Lewis and Hans and Hattie Hamann; in-laws Evelyn Umbach and Marvin (Pork) Umbach; sister-in-law Diane Fundermann; daughter-in-law Billie (Wink) Umbach. "Email Address" would like to share the life celebration of Janice Elaine Umbach. Click on the "link" to go to share a favorite memory or leave a condolence message for the family.